Domain Privacy allows you to hide the contact information saved in the Domain that would otherwise be available to the public. The option of making your contact information used to be applied only upon first registering a domain. 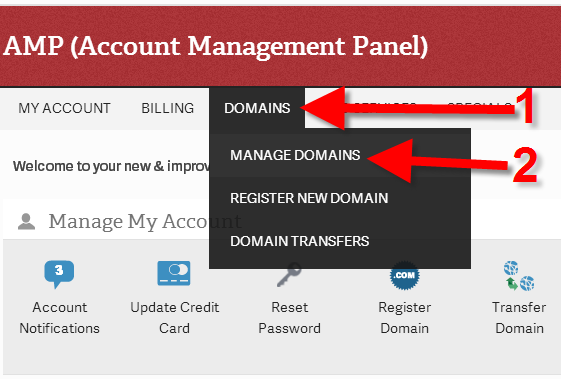 The latest update to the Account Management Panel has added the ability to add domain privacy to existing domains. The Account Management Panel (AMP) will apply the domain privacy and also automatically bill the account the appropriate amount based on the time period that you have selected. The following article explains how to find and this option within AMP. According to ICANN domain transfer policies, changes made to domain contact information may result in a 60-day transfer lock. You will then be on the Domain Management menu, click the Add Domain Privacy link to the right of the domain name. 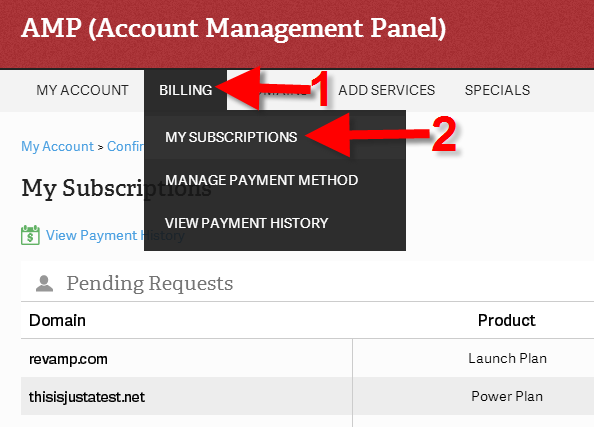 Make sure the billing information is correct then read through the Terms of Service and check the box to agree. **Note:Costs for domain privacy will be determined by the calendar year. So, for example, if you purchase domain protection in June, then the price is prorated so that you are only paying for the six months of the year where protection will be active. You will not be paying for the previous six months that have already passed. When you click the SUBMIT button at the bottom of the screen the payment will be processed and the domain privacy will be automatically applied. The privacy uses "Domain Admin" or "Domain Administrator" in the names listed for a WHOIS query. Additionally, the contact information given is the contact information of the InMotion Hosting Support Center. This information is used in place of your contact information. 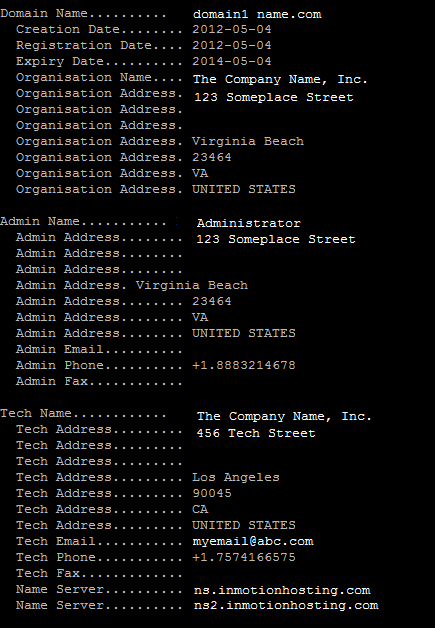 When you run a WHOIS in a command line environment or with a website, you will see that the contact information is clearly available. The contact data used when domain privacy is applied is actually the contact information for InMotion Hosting. This keeps all of the personal contact information private. As personal contact information is often targeted by marketing firms trying for advertising campaigns, domain privacy was developed in order to hide customer information from would-be spammers, data miners, and hackers. Find your domain privacy on the My Subscriptions page, and click the Cancel Domain Privacy link. On the Cancel Domain Privacy page, choose an address for your WHOIS information, and click the Submit button. You will then see a message stating "You have canceled your Domain Privacy subscription." Congratulations, now you know how to cancel Domain Privacy from AMP! We've added privacy to our domains recently and we received an email asking us to complete the verification by click a link. We did that but the page we landed shows "Invalid key provided. No active trade found.". We're very concern whether our domain will be suspended afterwards if we cannot complete the verification. Pls advice. You can check the <span class="strong">Status</span> of your domain by entering it into the <a href="https://who.is/">who.is website</a>. If you see a status other than something like 'ok', 'transfer prohibited', or 'update prohibited' then I would recommend contacting your domain registrar for that domain. do you revel any information about me to any one ? if i get a domain privacy ? Thank you for contacting us. The only information we require is a valid registrant name, or business name. Otherwise, our information will be listed in the whois instead of yours. I just bought a new domain and registered a .org instead of a .com -- is there a way to change that? If you registered the wrong name with us, you have 120 hours to cancel the domain. You can then get the correct one. Sorry for problem with cancelling domain privacy. If you are having problems with removing privacy, then you should contact our live technical support team so that they can remove it for you. You can contact them via email/phone/chat. Thank you for contacting us today. Here is a link to our guide on How to Cancel your Domain Registration. Hi, I wish to edit my domain registration information. I want to change from my personal name to my company name but I don't want to cancel my domain privacy. Is there a way to edit without cancelling my domain privacy subscription and then adding it back? If you are meaning the 'registrant' that cannot be changed via the AMP anyway. You would need to send in an email to the Support Team with that request. Be sure to verify the account with either the current AMP password or the last 4 digits of the credit card on file in the email. They will be able to make that change without you having to adjust the privacy.